Your ability to create power comes from the ground up; from your feet, through your legs all the way to your arms and finally to the club. You need to load your weight into your back leg and then transfer that load to the front leg as your arms fling through the shot. You need to able to take your muscles through their full range of motion, so you need to have strong, flexible hips and legs. To shift your weight from side to side quickly and efficiently, your adductors, hips, legs and feet initiate your downswing and weight shift. These exercises condition your muscles used to create a powerful weight shift. Watch Patrea from 15toFit.com demonstrate this exercise. Lunge to the side with your right foot, keeping your toes forward and your feet flat. Squat through your right hip while keeping your left leg straight. Squat as low as possible, holding this position for 2 seconds. Push back to the starting position and repeat on the opposite side. Watch Karen Palacios-Jansen and Christina Ricci, LPGA Teaching and Fitness Professionals, demonstrate the Cardiogolf Swing Positions. Set up with your Shortee Practice Training Club. Swing halfway back and stop. Check the clubface to make sure it is square. Swing to the top of the backswing and stop. Checking your body motion and arm positions. Slowly start the downswing and stop at the halfway down point. The clubhead should be behind the hands at this point. Stop at impact. Check the clubface position and make sure your weight is shifting towards the target. Slowly release the club and stop at the halfway through point. Arms should be extended. Finish the swing in a balanced position. Repeat positions slowly for 8 to 10 repetitions. 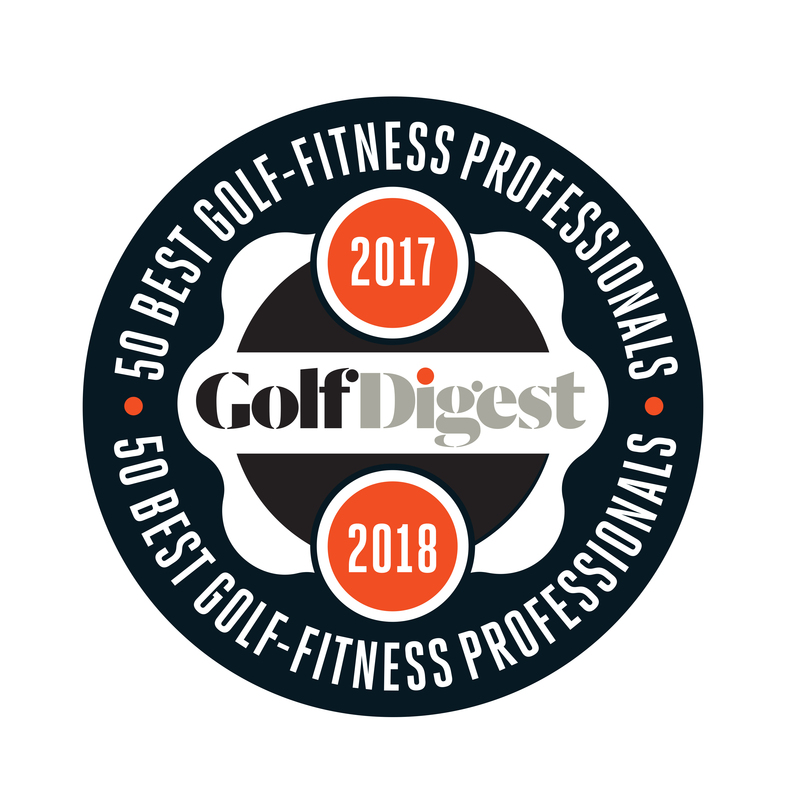 This is your Cardiogolf 5-Minute Golf and Fitness Break where we work our golf games and get into shape at the same time. In order to create power on your downswing, you need to ‘get behind the ball’ at the top of your swing. This involves rotating your shoulders and hips away from the target, so the majority of your weight shifts to the back foot at the top of the swing. Once you have wound your body up behind the ball, then you can shift your weight towards the target and fling your arms to hit the ball. Where a lot of people go wrong is they never quite get the lateral motion towards the target on the downswing. They either come over the top with upper body or hang back and use only hands and arms to hit the ball. Ideally, you need a little lateral motion towards the target to get the weight set in motion towards the target and then let arms swing through to finish. This weight shift drill will help you get the feeling of initiating with your swing with the lower body. 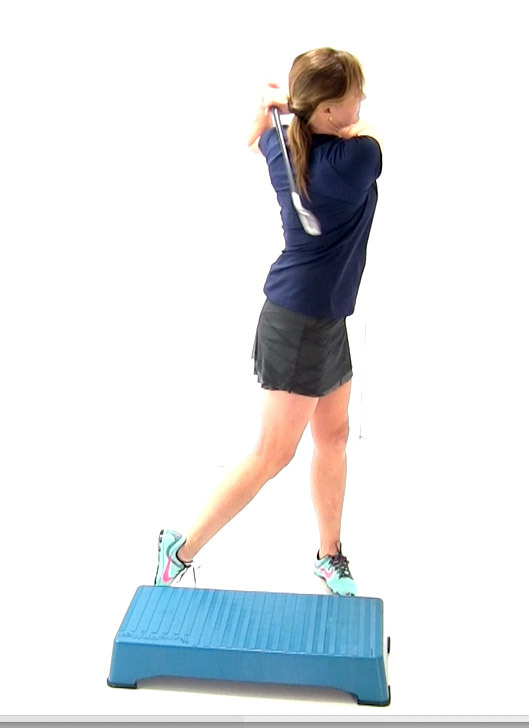 Watch Karen demonstrate a variation of a weight shift drill to create more power in your swing. Step up in an uphill lie. Make a backswing. Hold your hands away from your head as you step over the bench to the downhill lie. Follow-through and finish in balance. You can increase the intensity by speeding up the movements. Watch Karen Palacios-Jansen demonstrate the Cardiogolf Swing Positions using a small Pilates ball. It is a great exercise to do at home or in the gym to rehearse your swing. Karen Palacios-Jansen is the creator of Cardiogolf, a golf-fitness program available at Cardiogolf.com. 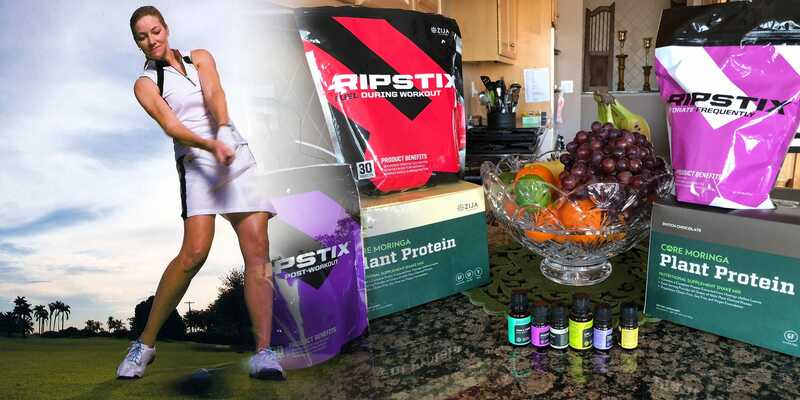 Karen’s website at www.kpjgolf.com is a ‘must-see’ resource for golf and fitness instruction. Follow Karen online on Twitter and Facebook. Your ability to stay balanced throughout your golf swing is important to create power. If you are unable to stay balanced, it is likely you will be limited in the amount of force you can apply to the golf ball while maintaining good fundamentals. Practicing balance exercises will not only help you improve your swing mechanics but also will help you increase your power as well. Stand in a normal golf stance, holding a club. Move your back foot behind your front foot, you may have to narrow your stance to balance. Lift your back foot off the floor and try to maintain your balance on opposite leg. Make practice swings as you try to maintain balance on one leg.